Former Manchester United manager David Moyes says he would like to manage Scotland "in time" but his preference is a return to club management. Scotland manager Alex McLeish has come under pressure following defeat by Kazakhstan in the Euro 2020 qualifiers. 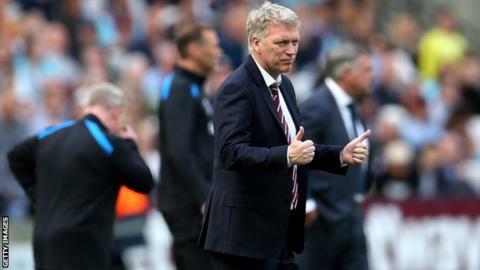 Moyes left West Ham United in 2018 after achieving Premier League safety in his six-month spell in charge. McLeish's side lost 3-0 in Kazakhstan to kick off their Group I qualifying campaign, and the team was booed off the pitch three days later following an unconvincing 2-0 win over San Marino. Moyes believes that fundamental issues with player development are at the root cause of Scotland's international struggles. "The Scotland job is difficult for anybody because there's great expectation," he told BBC Radio 5 Live. "I don't think there's any one way we can fix it. I don't have all the answers, but I've got some ideas and thoughts. Moyes has previously been linked with Celtic, but the former Everton and Real Sociedad manager believes that caretaker boss Neil Lennon has proved that he should be appointed in the role permanently this summer.